We signed away our house today and signed in to our new home. It was very satisfying to finally have reached this milestone, and cool to see the signatures of the folks we’re buying from above our names, knowing the couple buying from us will show up below ours. I didn’t want to jinx it, but I’m tremendously pleased to have sold our place on our own. Michelle, of course, did 90% of the “brain” work, and I helped with the braun. All told, this process has been smooth, but dependent heavily on luck and grace. The couple buying our place were in the neighborhood for breakfast and were passing by on their way to another house when they noticed our open house sign. The open house went great and stirred up a lot of interest, and resulted in us finding a buyer. The buyers have been wonderful; we just got back from dinner with them. One of the saddest parts of moving is that this couple won’t be our new neighbors. However, the decision to move has been hard, and leaving a home that I love and a neighborhood that I relish in is made bearable knowing that these wonderful people are moving in. Crap, now we have to move. Posted on June 27, 2007 Categories home and garden3 Comments on Signed, sealed…. My grandmother Viola Freed passed away yesterday. For my entire life, she (and my grandpa) has been in better shape than anyone else’s grandparents that I knew. Throughout my childhood we routinely hiked with my grandparents, even in Estes Park, high above reasonable oxygen levels found in the rest of the country. Even in recent years, the two were more active than I expected. So ironically, when her health failed, it was first Alzheimer’s, then cancer, and finally a broken hip that caught up with her. Grandma Duck, not Grandma Freed. We referred to her after the mallards that came from across the street in Hartwell Park. She was always composed, always appropriate, and probably the original source of my sarcasm. In fact, I’m certain she’s the source of many of my idiosyncrasies, and for that I am thankful. We had an impromptu wake last night with the remaining nuclear family and commemorated our matriarch’s physical departure. Ella never got to know her great-grandma duck, but for a few weeks, she was able to cross paths and even elicit a smile. We had to replace the sewer line as part of selling the house. We tried to just credit the buyer, but their lender wouldn’t give up the money until the repair was done. Crud. Luckily, we found a place that was able to fit us in before the closing and that stood up to the rigors of Angie’s List, though for a bit more. They were able to get in and replace the line quickly, and with surprising stealth. It was a bit shocking to come home one day with two huge holes in the yard and a trackhoe sitting in front of the house. The next night, the sewer line was in, the holes were filled, and the sidewalks paved, but the public sidewalk looked like hell. There was no roped-off area, just a still moist, well trampled and ridden on sidewalk with strangers names written in it. 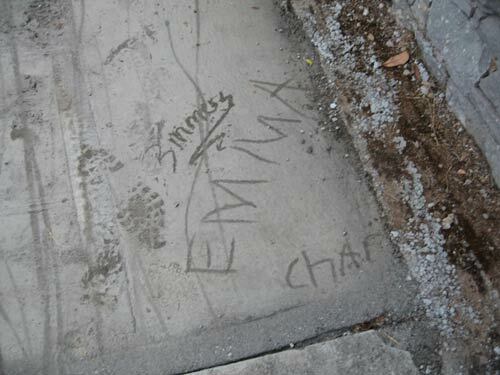 Second law of urbanomics – leave wet cement, welcome civic art. It turns out they were using a new mixer and it wasn’t going well. So they came back today and re-poured. Looks good, and without any marks, I had to leave something. I crouched and left my name in the very corner, where grass would soon cover again. I’ve got a fixation with sidewalks, and it was my cement, so I scratched away. Can’t fight the laws of urbanomics. This morning during the car trip over to my parents, I convinced Ella to string together two “dah” sounds to end up with a marginally accurate “duh-duh.” Close enough to Dada that I’ll take it. This evening after getting home a little late from work, I joined Michelle and Ella on a blanket in the yard and led her to again spit out a dah-dah. They’re just sounds to her still, and “dah” turns in to “bah” or “blah” quickly, but it’s rather satisfying to hear. Maybe the mother-child bond is really about “mah” being easier to pronounce than “dah.” Well, maybe it’s the whole food thing. We acceptend an offer over a week ago and we’re now past the inpection addendum and feel comfortable saying “we sold our house.” Well, we’ll start with “Sale Pending” just to avoid getting arrogant. The couple who are buying it make us feel ok with leaving our first home. Last night we reached our final agreements and all breathed a sign of relief. I’m sure we would have slept better if Ella hadn’t kept waking up. Did you know that Jeff Bridges is going to be on Craig Ferguson next Thursday night? I did – I get TV Guide Magazine. I’m not sure how or why, but I started receiving TV Guide Magazine a few weeks ago. Maybe even a few months. I’m not sure who Craig Ferguson is either. I really don’t have much use for it, so I just cancelled my mystery subscription online. Hopefully. I’ll be navigating the airwaves using Democracy instead.